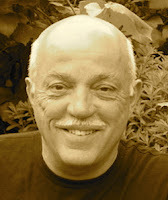 A Year of Being Here: David Budbill: "The Ubiquitous Day Lily of July"
"The Ubiquitous Day Lily of July" by David Budbill. Published online by The Writer's Almanac, September 4, 2013. © David Budbill. 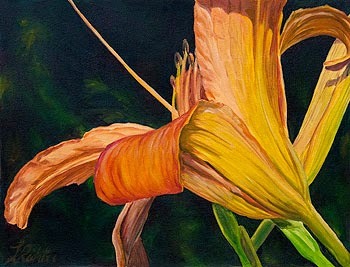 Art credit: "Tiger Lily Bloom," alkyds on mounted canvas, by Linda Richter. Caption: "The intense orange and yellow of the tiger lily comes to life. Sometimes just one and sometimes a row of them line the back roads of New Hampshire. Lush and green foliage sets off the brilliant orange of the blossoms."